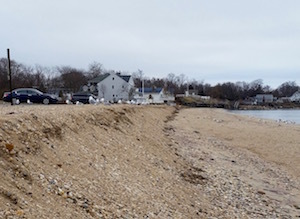 Southold’s Town Beach, which sits on the Long Island Sound in the erosion-prone bowl of Hashamomuck Cove, has fared badly in this winter’s storms, and town workers are concerned that if something isn’t done, the beach could disappear before the summer bathing season is upon us. Southold Public Works Director Jeff Standish told the Southold Town Board at its Feb. 28 work session that there is currently a steep scarp carved out by storm waves just five feet from the parking lot of the heavily-used public bathing beach, which sits along a precarious stretch of County Road 48 between Hashamomuck Cove and Hashamomuck Pond. Tuesday morning at Town Beach. Mr. Standish said he’s been in touch with Cross-Sound Ferry Manager Andy Binkowski in Orient, who has offered plentiful dredged sand there for free if the town provides a truck to pick it up. Mr. Standish said the town highway department has volunteered a truck and a payloader to move the sand, but the town will need to get emergency DEC permits before work begins. 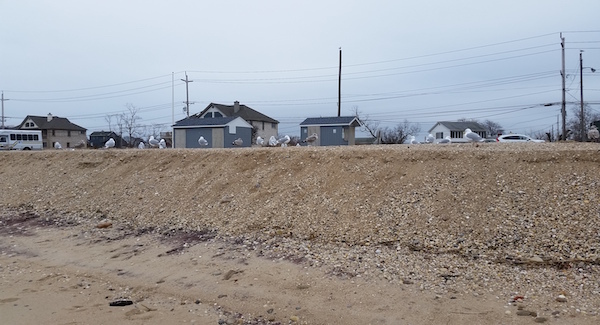 The town’s existing permit only allows workers to move sand from the edge of the parking lot back onto the beach, and the town budgets about $5,000 per year to move the sand, said Mr. Standish, but he said the town has spent about $50,000 since 2011 on emergency repairs to the beach. Councilman Jim Dinizio was skeptical about the project. Mr. Standish said that if nothing is done, the erosion will only get worse. “If we don’t do this, it’s going to be at Route 48,” he said. Town Supervisor Scott Russell said the county could easily fix the problem, but at the expense of the public beach. Councilwoman Jill Doherty asked if the U.S. Army Corps of Engineers, which has proposed a beach replenishment plan for Hashamomuck Cove, could get involved on an emergency basis. “I don’t think we’d get anything in government unless there’s a tragedy,” said Mr. Dinizio. The town has been working out beach access and local sponsor issues with the proposed Army Corps Hashamomuck Cove project. Mr. Standish said that, once the town has an emergency permit in place, they can move five to six loads a day of sand, for 10 days, from Orient to the beach, about an 11-mile trip.